Morning all! I hope that if you’re having a heat wave like we are in Montana, you’re staying cool! I am sweltering and not staying cool because my 6month old is on a nursing streak and he’s sweaty – which makes me sweaty and him more sweaty. Ugh. It’s a sweaty mess. 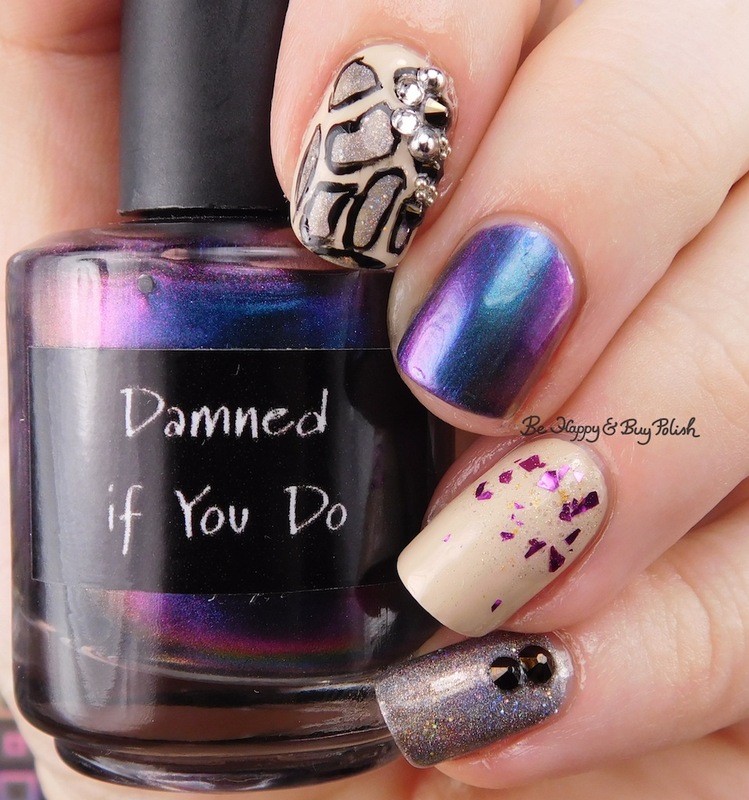 How about a mani that isn’t a mess….or maybe it is? I dunno. At first I didn’t really like it but then it grew on me. Let me know at the end what you think. So I started off with OPI You’re So Vain-illa on my ring and pointer fingers. On my pointer finger, I used a giraffe print (maybe it’s a cheetah print?) decal and used Painted Polish Gray Goddess, then outlining with China Glaze Liquid Leather. I added some gems from Crystal Parade in the corner – didn’t really like how it turned out though. On my middle finger and thumb (obvs not shown), I used 2 coats plus top coat CrowsToes Nail Color Damned If You Do. This is such a beautiful multichrome polish (I’ve already used it in another mani you’ll see on the blog) that I decided not to paint over it. 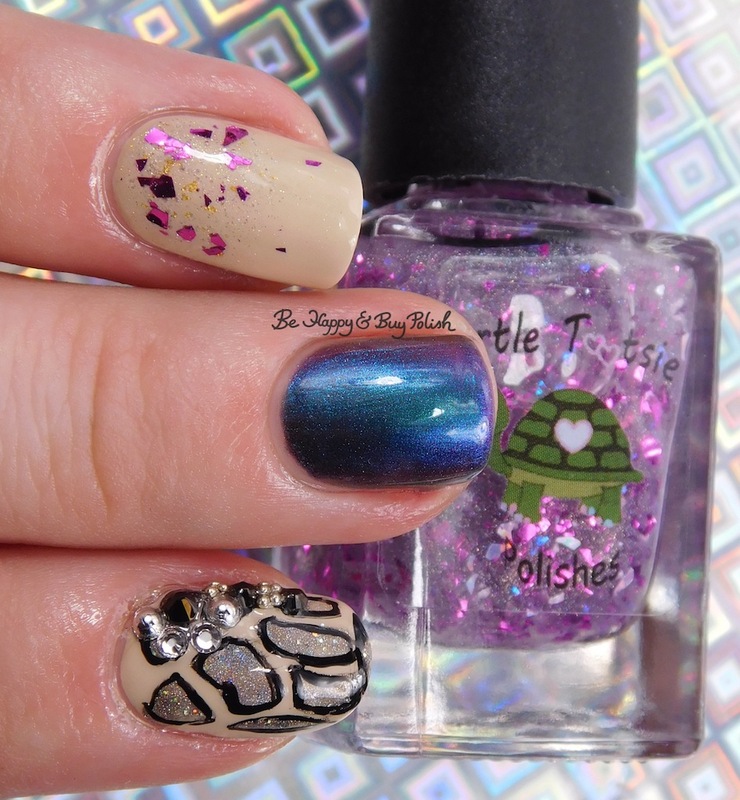 Over You’re So Vain-illa on my ring finger, I used Turtle Tootsie Polishes Aquarius – gorgeous clear based shard topper. I need to use this again as I don’t think I’ve shown it off enough here. I needed to amp up the oomph factor so I sponged some of OPI Don’t Speak on top of it. Lastly on my pinky, I used 2 coats plus top coat of Painted Polish Gray Goddess with 2 multichrome (which disappeared with top coat!) studs from Crystal Parade. Well – what do you think? Something you’d rock or not? I like all the different designs on the nails.